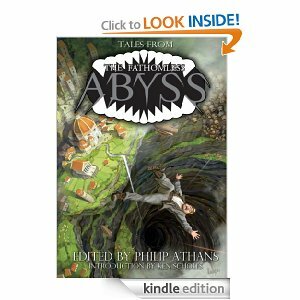 Cover for Tales From The Fathomless Abyss, stories by Mike Resnick & Brad R. Torgersen, Jay Lake, Mel Odom, J.M. McDermott, Cat Rambo, and Philip Athans. I’m turning in something today that I’ve never tried before: a novella. Then I started on the novella. The first thing I did was look up the length requirements. Wikipedia told me the official SFWA definition was 17500 to 40000 words. So just a long short story, right? The problem with that was that…I write short. I excel at under 4000 words. So I turned again to a model. I’d been thinking about issues of addiction and so I decided I was going to write about that, and use William S. Burroughs’ JUNKY as my starting point. And I was going to throw in a touch of Lovecraft for spookiness and make the drug of my protagonist’s choice something a bit weird. And I wanted to reference some of the cool stuff the other Fathomless Abyss writers had added to the world. So that’s what we have. I’m turning in A SEED ON THE WIND this time and A CAVERN RIPE WITH DREAMS will follow on its heels. I know mine is focused on the development of a protagonist who I fear is somewhat unlovable. I’ve tried for interesting characterization and today I’m finishing up adding a layer of luxuriant description. If you’ve come looking for advice on writing novellas, I’m not sure I have any. Perhaps you, the readers, can tell me what you think of them and what you’ve done when trying that form. I know Rachel Swirsky is a champ at writing them. What do you think – do you like novellas? What do or don’t you enjoy seeing in them? Can you think of anyone you think does them exceedingly well? This entry was posted in publications and tagged a cavern ripe with dreams, a seed on the wind, fathomless abyss, joe lansdale, lovecraft, novella, o. henry, rachel swirsky, william s. burroughs, writing novellas. Bookmark the permalink. Don’t know nothin’ about writin’ no novellas, but I am certainly looking forward to reading yours. A touch of Lovecraft improves any dish. Also, thanks for mentioning Lansdale’s Drive-In stuff a while back. I downloaded The Complete Drive-In and liked it a lot, although damned if I know why. It shouldn’t work but it does. I think DRIVE IN is an absolutely fabulous book for conveying that the writer can go anywhere they like in a book and they can be as gonzo and bizarre as they like. Try to describe it to someone and it doesn’t sound all that great (except for the Popcorn King), but it is just so wonderful and weird while at the same time you care deeply about the characters. I’m trying to think of other books that do that, which would make a great blog post. Dhalgren maybe. At least I cared about the characters and you can’t deny it’s pretty weird. Of course I haven’t read the book you’re talking about (yet) so I may be off base, but there you go. Words to live by, my dear. That’s awesome, Bud, I really like that!